I love the taste of Spring. Everything is so light and fluffy; like a cloud or something. I know I sound like a freak right now, but the light dishes that come along with Spring and Summer really put an extra pep in my step. The Fall and Winter months usually bring heavy dishes that make me want to have nap time right after I consume them; but the Spring and Summer months always bring dishes that fuel me to do more. If I had a roof top, I'd stand on that rooftop and declare my love for all food, but particularly the foods that are abundant during Spring. Unfortunately, I don't have a rooftop; I have a blog. This blog is my rooftop and my love has been declared. This week's Bountiful Basket provided me with an abundance of zucchini. 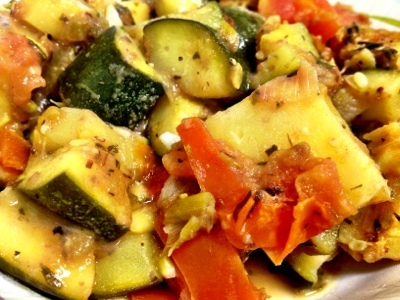 I've dabbled with a few ideas: baked zucchini boats, zucchini chips, but this zucchini Provencal really hit the sweet "cloud" spot that is Spring dishes. You're invited to dig your teeth in, after you make your own of course. Add zucchini and celery; cook another 10 minutes, or until tender. Add tomatoes, basil, herbs de Provence, nutritional yeast, salt, and pepper; heat uncovered until all is soft and tender.